KDDI CORPORATION is implementing telecoms business operations in Myanmar, together with Sumitomo Corporation and Myanmar Posts and Telecommunications (MPT). As smartphones come into widespread use in Myanmar, demand for social networking services (SNS), video sharing services and content use is increasing. MPT has been offering LTE+ high-speed data transmission services since May 2017, and began offering a reward program in May 2018 as part of ongoing service upgrades. 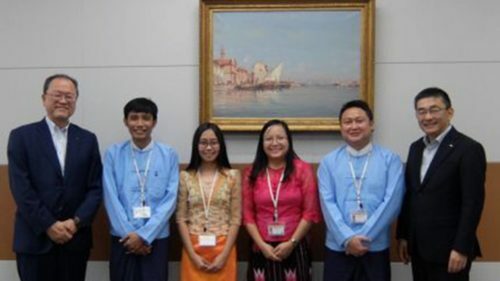 KDDI has been working to further improve the quality of telecommunications services and service development capacities in Myanmar by carrying out a long-term training program in Japan to improve the technological capabilities and skills of MPT personnel. On June 29, 2018, the program completed its first year of training, producing its first graduating class, the members of which will now return to Myanmar. In addition to telecommunications service know-how such as network planning, design, construction, testing and operation, the program?s first graduating class will have learned how to devise and propose strategies in other service fields such as payments and content. After returning to Myanmar, they will be assigned by MPT to practical positions where they can put the lessons and experiences of this program to work, and set up new services while revising operational procedures.